As a historically Euro-American institution, we are conscious of our responsibilities for the historically marginalized. We celebrate Black Heritage Month, welcome African-American community leaders to the pulpit throughout the year, participate in the North Side Old Timers, hold anti-oppression workshops, and host musical performances and other artistic events that empower women and people of color. In addition to our work with neighbors who are poor or homeless, we actively support anti-violence work through, among other projects, One Vision One Life, the North Side Peace Network (NSPN), and the Women’s Walk for Peace. 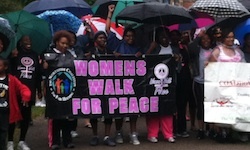 See more photos from the 2012 Women’s Walk for Peace. 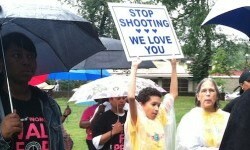 Read coverage of the 2012 Women’s Walk for Peace from the New Pittsburgh Courier. Read coverage of the North Side Peace Network’s “Peace Gathering 2012” from the New Pittsburgh Courier.